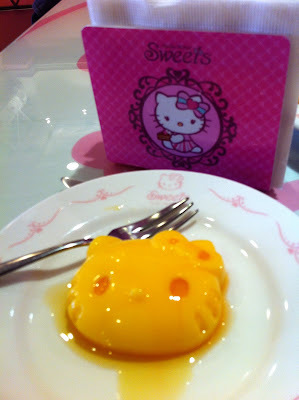 What would you expect from a restaurant called Hello Kitty Sweets? And all that eye candy is at the front of the store before we sit down and order. Besides the desserts that you can order from the counter, there is also a full menu of pastas, gratin rice, grilled meats, pizza and even a Hello Kitty hamburger and Hello Kitty bread bowls, as well as afternoon tea sets. The menu is only in Chinese and can be a bit confusing, but there is a picture for each dish and the waitress was helpful in explaining what is in each dish when we asked. The price for each dish is for a set meal, which includes a drink, salad, soup, bread roll, choice of small appetizer along with your main dish. I had put off checking out Hello Kitty Sweets because I heard that there were long waits and the food was not worth the prices, but on a weekday, I had no problem getting a reservation for a large table (made a few days in advance) and my low expectations for the food probably helped me keep a reality check. 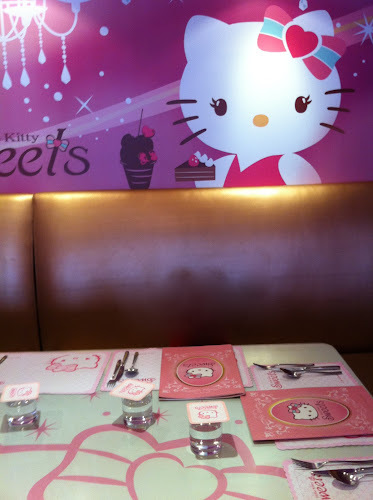 I definitely wouldn't come just for the food, it's more for the whole experience and I had a bunch of Hello Kitty fans in my group as I was hosting my cousin and her daughters. I was definitely surprised to see almost all the other tables were adults, some cameras in hand, and quite a few men too (perhaps dragged or bribed there?). 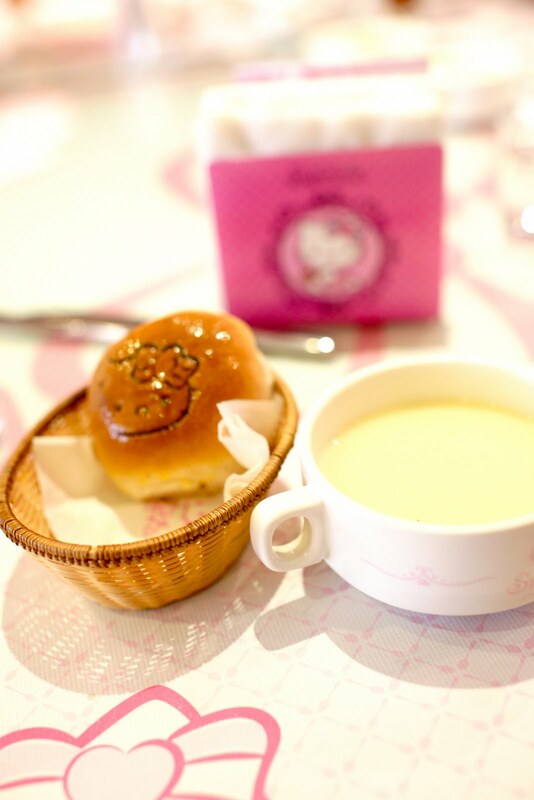 The starters in the set are forgettable- a small salad, a mysterious creamy soup- but the bread roll is the first Hello Kitty photo op. The choice of appetizers included escargot and smoked salmon, but I opted for this liver pate. The food came at a relatively steady pace and the main dishes were a good size. I snuck some of the fried appetizer plate (NT$380 ala carte) that my cousin's kids ordered which included onion rings, fried chicken, croquette and fries. Tasty. I don't know why, but I asked for the egg on the meat sauce spaghetti (NT$400/set) to not be raw. It came out more fried than soft boiled like I've enjoyed at Bellini Pasta Pasta. If there's a next time, I'll have to try it as is so that I can stir it all together. The spaghetti had typical sweet, tomato flavor. 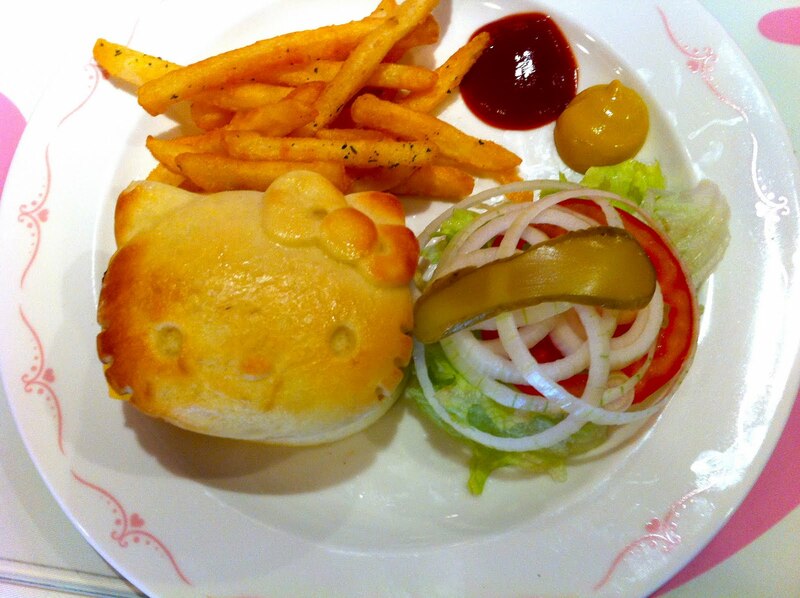 But where's the Hello Kitty meatball or Hello Kitty cheese cutout? Lol. Lots of pesto and shrimp (NT$400/set) in my cousin's dish. The kids loved it and finished it. 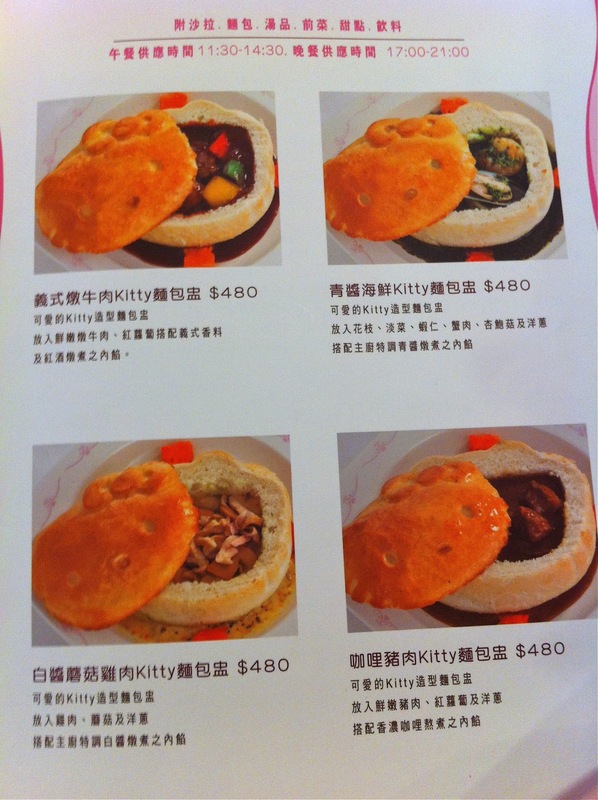 The Hello Kitty burger (NT$450/set)! I didn't try this, but I thought about ordering it. Would it be one of the more manly things on the menu? LOL. Set drink (very sweet ice tea) and set dessert- a creme brulee Hello Kitty pudding. 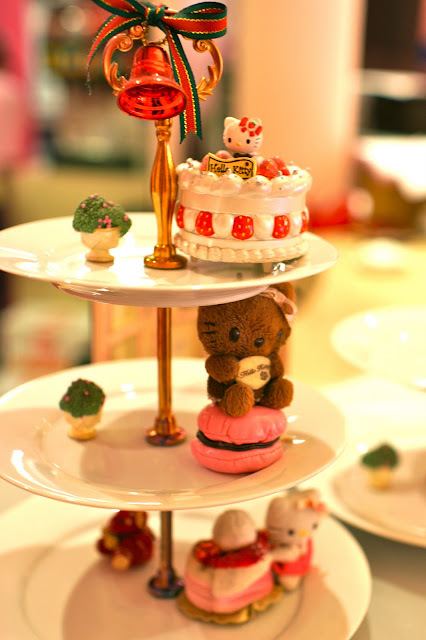 We didn't have to room to sample any of the cute cakes that I saw, but perhaps on another occasion. There's a NT$300 minimum per person fee to dine in, but if you just want to get some cakes to go, there's also a mini Hello Kitty Sweets at the nearby Fuxing Sogo selling cakes and desserts. 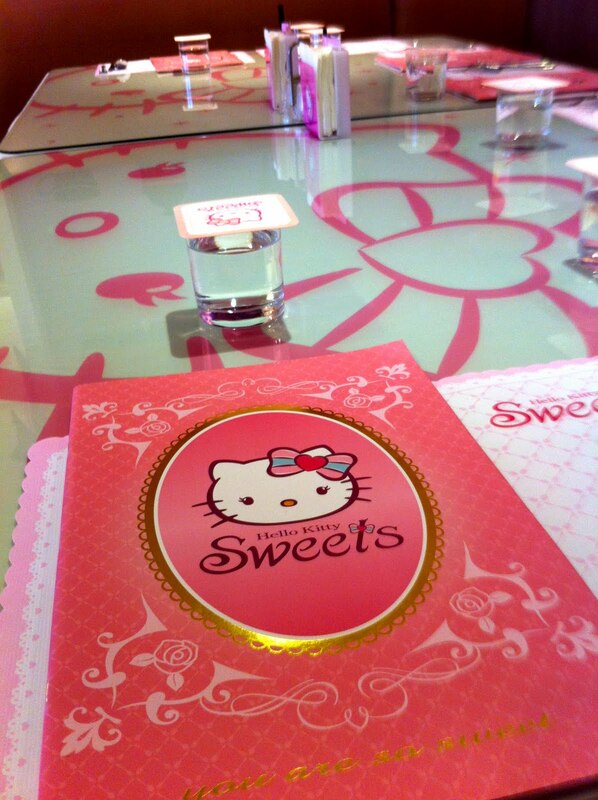 But then you don't get to breathe the Hello Kitty Sweets atmosphere and cuteness. There's even some souvenir goodies available to purchase behind the counter, but I didn't realize it until I was browsing other blogs. 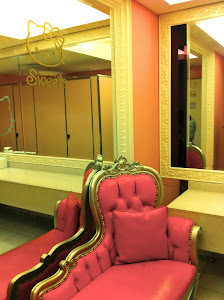 Did I mention even the bathroom is Kitty-fied? Is this too much, or the complete experience? 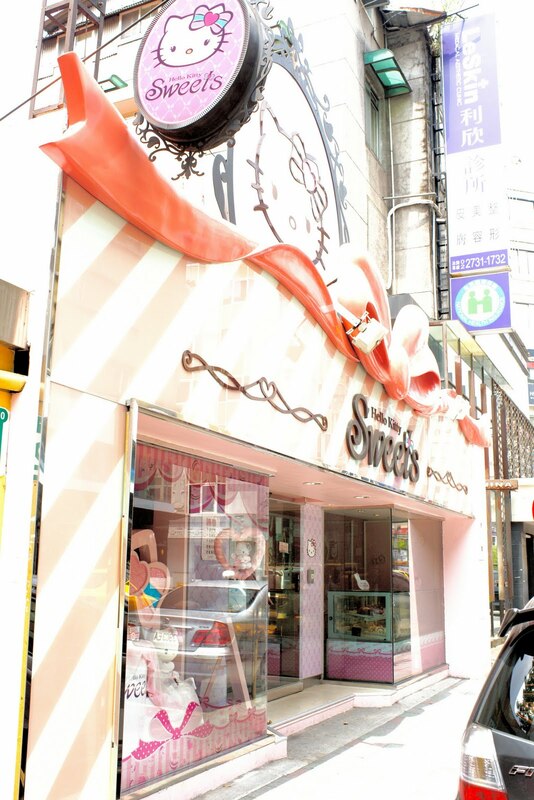 Hello Kitty lovers- how far would you/did you fly from to eat at Hello Kitty Sweets? I know for some of you this might be a "must" destination for your Taipei trip. For those of us lucky enough to have it in Taipei, it's worth a visit if you are a Hello Kitty lover (like me), or want to treat one to a meal. happy blogiversary to me! six years and counting.. Happy 6 year blogiversary to me!! It's been six years since I first started a hungry girl's guide to Taipei and had no idea where to go or what to eat. Now I'm happy to have a mental map in my head, have my favorites on speed dial and still be discovering, eating and enjoying the awesome food in Taipei. I hope you are still enjoying reading, whether you live in Taipei or are just drooling over the food from afar, whether you've been lurking for years or just found it today! A lot has changed in the Taipei restaurant scene, the blog and my own life since I've started HungryInTaipei, and I look back fondly on the archives with no regrets. I'm headed to LA in a few days, bur don't worry, I've been writing up a storm so that when I'm away, trying to get Ludobites 007 reservations, waiting in food truck lines, running around the OC County Fair, and eating red velvet cupcakes, there will still be new posts to look forward to every week. Plus, I probably won't be able to resist mobile blogging some of my LA (And OC/NY/Hawaii) eats here and on my Facebook and twitter. Don't forget to leave comments on restaurant posts that you've found useful and share your experiences and favorite dishes, and especially if you a suggestion for a place I should try!! Oftentimes Chinese food isn't seen as luxurious as other cuisines and maybe in some parts we have ourselves to blame. We revel in that we can eat a huge bowl of oyster vermicelli for only NT$45 and we'll do it standing up with no tables or chairs, slurping down a hot bowl without vanity. We'll eat whatever-on-a-stick and stinky tofu and wander the alleys of the night market in hunt for late night cheap eats with swarms of other sweaty people in the middle of a humid Taipei summer (because a huge tsui jian bao is only NT$10!) But this all because it all tastes SO good, who needs all the frou frou? But maybe it wouldn't be so bad if Chinese food was fancy. A place nice enough to take your parents that won't have them complaining how overpriced the food is for such small portions (like my one time attempt at taking my parents to PF Changs for "nice" Chinese food in LA). A nice place that isn't Japanese or Italian or a steakhouse, so for the grandmas and extended Chinese relatives that only eat things that go with white rice. 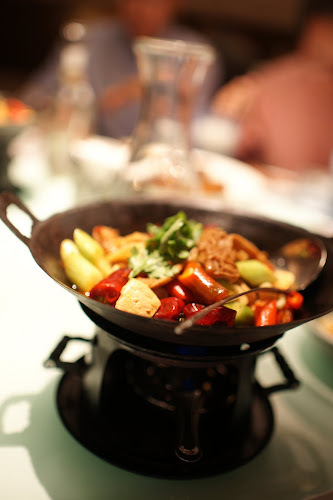 1010 Hunan Pop Cuisine blends modern style, taste and family dining into an upscale setting that is relaxed enough for you to get your hands dirty. It's also brings Chinese food to the table for those that like it hot and spicy with family style sized portions. The English and Chinese menu has a pictures for most items as well as pre-set menus with drinks and dessert for a slightly better value. Look for the level of spiciness of each dish noted by the number of chili peppers next to it. This post will include dishes from two different meals (and two different locations), as the first time I went with a group of girlfriends we got to try more things to share. The more recent lunch at the Eslite location was to jog my memory and double check that it was as good as I remembered. And it definitely was. A couple tips- splurge on a drink and rice. Many of the dishes are gonna be putting mini-fires in your mouth and the lychee drink and steamed rice definitely helped soften it. Order one or two fried pork ribs with chili and fennel spices per person. 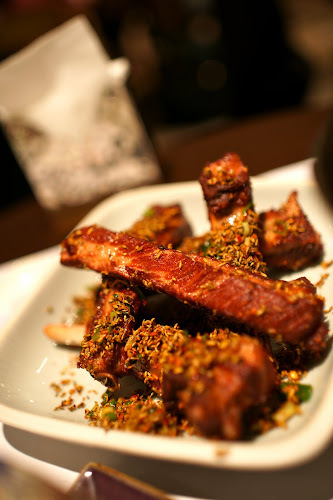 This is their signature dish and not cheap at NT$150 a rib, but it's worth it. 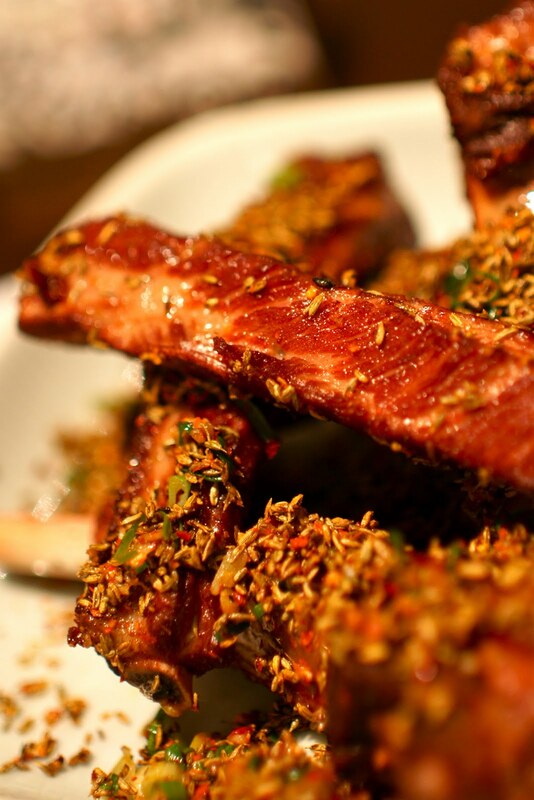 Tender meat packed with flavor, the fennel seeds give it an unique aromatic crunch that's not overpowering. This is the dish that will have you coming back, or at least thinking about going back for a few days. And the good thing is that you can order this dish no matter if you are dining alone or with a lot of people, since they just charge per rib. Other favorite dishes I recommend ordering- the sauteed smoked pork with preserved bean, which is sour, smoky and crunchy. 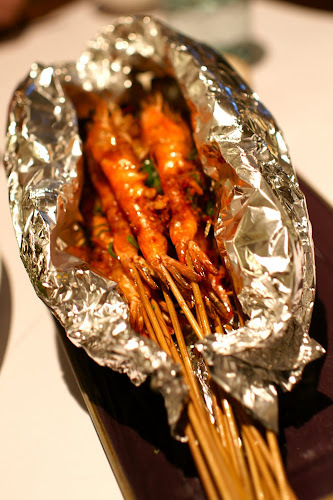 The fried shrimp skewers which have a kick to them and can be eaten whole with the crispy skin on. I peeled the head and legs off of mine. There are a lot of skewers in one order and so even more reason to bring a lot of people so you can order more things! I didn't dare drink the soup for the Hot Pot Preserved Tofu & Pork Intestine, but I kept scooping out the chewy intestines, blood cubes and stinky tofu to go with my bowl of rice. This dish has the maximum three chilis next to it on the menu and you can see all the chili peppers, sporting varying shades of red. The Beef and vermicelli with pickled cabbage (NT$300) reminds me a little of the Korean glass noodle dish japchae. or Fried squid Hunan style. In the spiciness department, I admit that I can only handle so much, but I enjoy the dishes at 1010 Hunan because it's layered and has depth instead of just of being knock you over the head spiciness. But for those looking for some serious heat can sure to be satisfied here. And for the non-spicy eating diners, don't worry, there's a lot of hearty options available too. I was addicted to the bitesize, chewy steak cube with rice cake and pine nuts (NT$320) to counter the spiciness of the other dishes. Can't go wrong with kon ching tsai or sauteed water spinach with garlic. as did the Pork belly in brown sauce with preserved vegetables (NT$330). Save room for dessert. I love the black sesame milk with tapioca & ice (NT$99) which is sweet and soothing way to end the meal, with finely shaved ice, bubbly tapioca and nutty sesame flavor. I love that living in Taipei allows me to explore all different kinds of Chinese food- from Sichuan to Hunan to Sanxi to Canton to Yilan to Taiwan- as well as in every form, from street eats to sit down restaurants- 1010 Hunan Cuisine is definitely worth the splurge.